Saturday was a separation day for the top teams in college football, with Penn State and LSU bowing to some truly elite teams, providing some clarity as we move forward. Like all ELO systems (including our version for the NFL), PFF ELO is an iterative system that updates each team’s rating after each game based on two things: how well they played against their opponent and how well they were expected to play against their opponent. The PFF ELO rating system measures the former using our unique offensive, defensive and special teams grades, while the latter is determined by the PFF ELO ratings leading up to the game and where the game is played. Sometimes in football, the best team does not win, and PFFELO accounts for these oddities by using our grades. Hence there will be teams rated higher or lower in this system than their win-loss record would suggest. Since PFF began charting college football in 2014, the difference in PFF ELO values alone has been able to explain over three-fourths of the variance in the closing Vegas line. 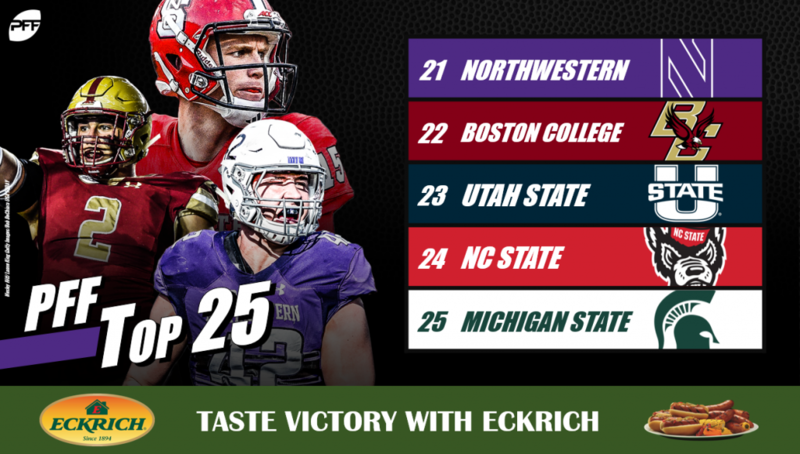 Check back to profootballfocus.com for weekly college spread picks using this model and check out PFF Greenline for our NFL version of the product. 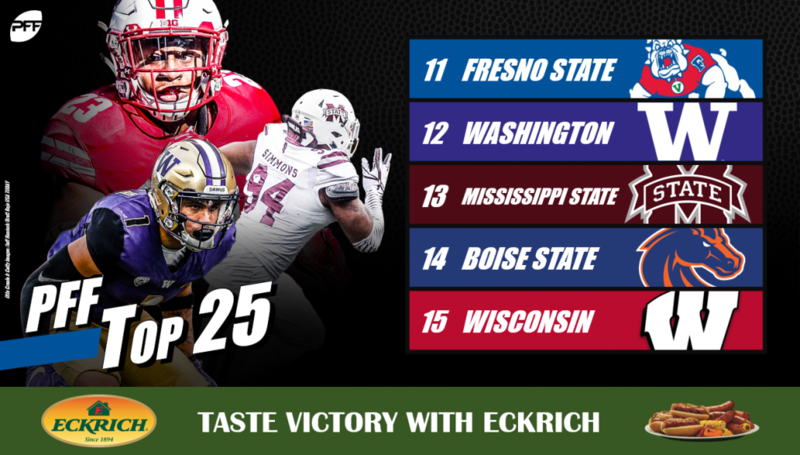 The PFF ELO College Power Rankings are brought to you by Eckrich, the Official Smoked Sausage of the College Football Playoff. The Crimson Tide showed why they are the best team in college football by blanketing LSU in all facets in Death Valley. Since their defense pitched a shutout and it’s hard to lose when the other side doesn’t score, we will focus on their defensive prowess. Their pass-rush applies pressure on over 40% of dropbacks and that pressure rate increases to 50% when they blitz. In coverage, they have contested 17% of pass attempts and allowed a passer rating of 65.9. Although rush defense doesn’t matter as much as coverage, it is still debilitating to opponents when you dominate at it. Through 10 weeks, Alabama has hit the opposing running back at or behind the line of scrimmage on 53% of rushing attempts. They are as good as advertised both offensively and defensively. The Tigers dominated Louisville at home as Trevor Lawrence further separated himself from the freshman class of quarterbacks by recording a 121.7 passer rating on throws when he was kept clean from pressure. He has, for the most part, played within the talent of this offense. He has rarely forced throws, evidenced by the fact that only 11% of his attempts have been contested. 28.2% of his attempts have been positively graded, yet only 2.0% of his throws graded as big-time throws, which shows that he has been elevated by the talented skill position players around him. Clemson should be able to roll through their remaining ACC matchups on the strength of their defense and running game. Georgia ran away with a big road win against an overranked Kentucky team. Georgia averaged 4.8 rush yards before contact on Saturday, but before this matchup, they had averaged 2.6 yards before contact per attempt. Jake Fromm provides when called upon but rarely needs to with a defense this good. Deandre Baker continues to grade as the best coverage corner in the FBS. In coverage, he has allowed a passer rating of 34.9 with 8 passes broken up and two interceptions while contesting nearly 44% of total targeted attempts. Notre Dame survived a late rally and ground out a victory against Northwestern. A once formidable stretch of games to end 2018 now looks very doable with matchups against sinking Florida State, a team our model has at #42 in Syracuse, before wrapping up with USC. The Fighting Irish will inevitably go as far as Ian Book can take them. Generating an EPA per dropback of 0.28 and twice as many big-time throws as turnover-worthy throws; reasons for optimism are apparent. However, Book has graded out as just the 34th best passer according to PFF grades and will need to improve on his passing in between the numbers if the Irish want to compete with the best in the college football playoff. Once again, Michigan was smothering against a good Penn State team, allowing Trace McSorely only 83 yards through the air, zero passes completed over 20 yards downfield and just three completed over ten yards downfield. 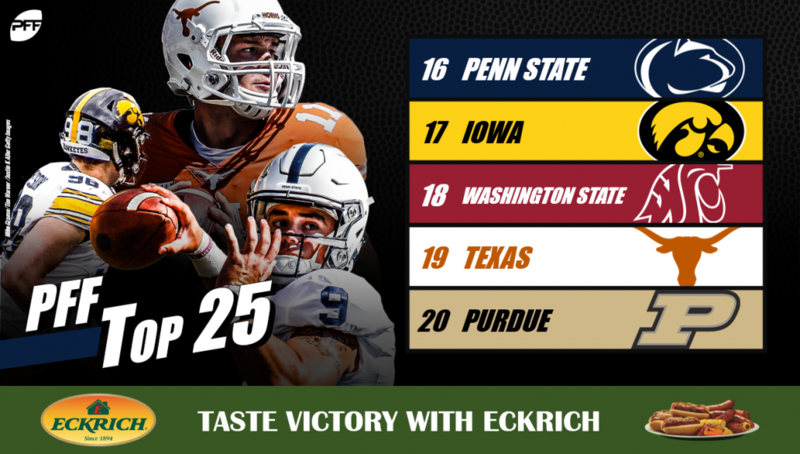 They are the best in the Big Ten in terms of success rate allowed on both early-down runs and passes, and to us, the team is just barely on the outside looking in as the stretch drive commences for the College Football Playoff. Oklahoma battled through early-game turnovers and shoddy defense in Lubbock Saturday to keep their hopes of a playoff berth alive. Kyler Murray was a electric as usual, converting 32 (of 38) clean dropbacks into 9.3 yards per pass attempt and three touchdowns. He and running back Trey Sermon also picked up more than 300 combined yards on the ground, with only 94 of those yards coming after contact. It will be interesting to see if they can make it into the top four being so one-sided, but one has to think that having Murray, Sermon et al. in the playoff would add an enticing element to the mix. Central Florida was back to their high-scoring, point-spread covering ways last Thursday against Temple, with McKenzie Milton (pressured just 11 times) generating a passer rating above 100.0 both under clean and pressured conditions. Greg McCrae averaged more than 11.5 yards per carry, including generating 120 yards after contact. They should be more than a touchdown favorite in all three of their remaining games, meaning that a second-consecutive undefeated regular season is more than within reach for the Knights. Ohio State struggled to beat a down Nebraska team on Saturday, as their defense continues to struggle. They are in the bottom half of the Big Ten in terms of early-down efficiency, allowing more than 45% of early-down passes to be graded positively. They pressured Nebraska quarterback Adrian Martinez just nine times out of 40 dropbacks, and when he was clean, he generated a passer rating of over 100.0. Quarterback Joe Burrow was found out a bit on Saturday against the Crimson Tide. While it’s true he was under pressure on 21 of 45 dropbacks, he earned just a 51.3 passer rating when he had a clean pocket, averaging just 5.5 yards per attempt and failing to get the Tigers into the end zone. While it has still been a good surprise year for LSU, they are squarely out of the conversation for the playoffs after week 10. After a close win at home against Texas A&M, Auburn is in our top 10 on the strength of a defense that generated three sacks and eight quarterback hits while holding Kellen Mond to 6.6 yards per pass attempt for the Aggies. Jarrett Stidham, on the other hand, was great, generating a 120.1 passer rating from a clean pocket and averaging 10.5 yards per attempt on the rare occasion he was pressured.